A repost from my nephew, Big Al’s nursery days, when our old cat Kit Kat was still ruling the house with a rod of iron. Al was about three at the time. The dog has just looked up from Tolstoy’s War and Peace, and given me a baleful brown-eyed reproach. He has nothing whatsoever to reproach me for. He has been well fed, run helter-skelter round Crown lands, and been given a maths lesson by seven-year-old Felix who has just found and abducted the Big Family Calculator for dog tutoring purposes. I am unsure why the dog has chosen as his bedfellow one of the greatest writers Russia has ever bequeathed the world. I had him down for more of an Agatha Christie kind of dog. But preconceptions can be misleading, it seems. Beware of pigeonholing your pets. They may surprise you. Here’s another preconception: I know how one should pick up a cat. I also have a pretty good idea what cats will put up with and what they won’t. They have claws and teeth and an attitude, and a loud yowl to boot. If things are not going their way, it is my experience that they will let one know, in no uncertain terms, that the situation is not to their liking. A cat will simply summon its staff with all speed to remedy the problem. I collected my nephew, Big Al, from nursery the other day, and came home to rustle up some lunch for the two of us. I left Al comuning with some of Felix’s cars. They were already beginning a full-scale debate with each other as I left the room to sort dinner out. Kit Kat, our stately tetchy tortoiseshell cat, sat in stately splendour near the hearth. And when I returned, less than a minute later, Al was, quite literally, brandishing Kit Kat, our long-suffering family feline, high in the air. He had a fist full of tortoiseshell shoulder in each hand, and was excitedly telling me about Kit Kat in considerable detail, reaching as high as he could and swinging her to and fro in companionable rugby-scrum camaraderie. As I remember back to that horrified freeze-frame moment, though, I must own that – against all the odds – Kit Kat did not seem to mind. Her eyes were not staring and she was not uttering a squeak of protest. She had not lashed out at Al in any defensive gesture. She was just swinging to and fro, seemingly complicit in the whole surreal Gilliam-esque experience. I broke it up, naturally. Ever since, she and the toddler from cat-hell seem to have been the best of chums. There is no hint of hysteria in Kit Kat’s demeanour as they saunter together down the hall past the dog and his Tolstoy. And so I sip a cup of tea, this afternoon, and wonder idly who will confound my expectations next. It is as well, at times like these, to eye one’s spouse beadily. He has never been a conventional soul. I wonder, will he be next? Posted in Macaulay The Dog stories, Shrewsday MansionsTagged dogs, pets, toddlers, TolstoyBookmark the permalink. Brilliant post. I had the grumpiest cat alive when my stepdaughter was little, yet he made no protest at being dressed in doll’s clothes by her and being towed in a little trolley behind her tricycle. Isn’ it strange, Cindy? Cats seem to have a sixth sense about these things. Maybe they see the kids as boisterous kittens. 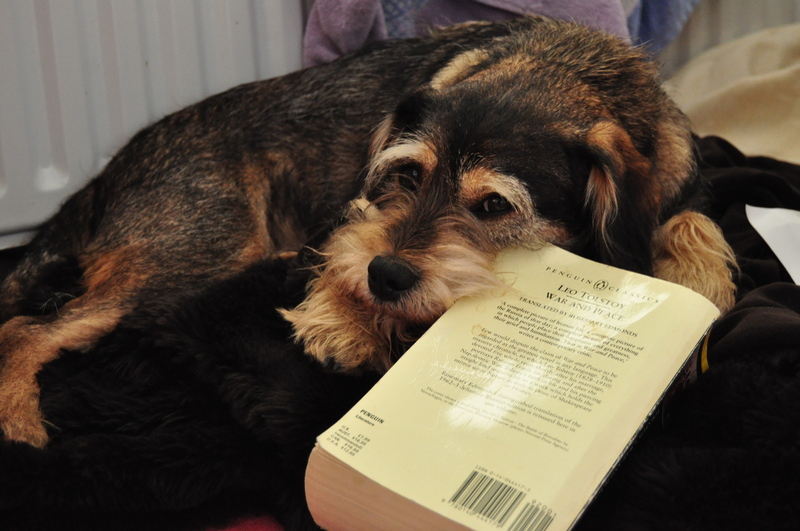 Never mangaged to finish War n Peace – bested by a dawg! *brag* You should try my abridged version in rhyme – I reduced the 6000 pages to 105 words! Now that is a book I wanna read! Ha! A well-read mutt, but all accounts, Jim. Isn’t it amazing how a cat quite willing to shred the unwary visitor or dog can be as putty in a toddler’s hands? Mac is the same. *curious* Did the spouse then live up to awful expectations? The spouse is never, ever predictable, Col. His chief weapon is surprise. If I develop preconceptions, they are immediatey vanquished. Not a boring marriage! Most husbands are very soon incapable of doing anything which will surprise their wives. A literate dog is a thing of beauty. A toddler and a cat: now that’s a recipe. I was young when I read War & Peace after seeing the movie with Audry Hepburn, Henry Fonda, and Mel Ferrer. The year before Dr. Zhavago came out with Julie Crhistie and Omar Sheriff and so I read the book. I decided I loved all things Russian and would have to marry a Russian novelist or poet. I ended up marrying an Italian banker. So much for that. Enjoyable post as always. Thank you. I have always held a candle for the Russians, Jamie: their music and art just seduces. Me, I watched The Rite Of Spring, the Diaghilev version, and fell head over heels in love with the genius behind that ballet. I thought you were going to put the re-post blurb at the bottom? IE, you and me both. Thanks Wanderlust. Yes, Kit Kat had her moments. She was far more tolerant that I ever gave her credit for. Love anything with Big Al in it, the wisdom of youth apparently captures the spirit of “cat”. An admirable policy, Tandy. One needs a great deal of time to do it properly, I believe. With respect to the departed, I think the cat knew that if it came down to it, he could take on Big Al and win. Rafael, your speak the truth. Fessie up, you forced Tolstoy on that poor poor dog, come on admit it, As ‘fur’ Al and Kit Kat -serendipity runs in the family. The unconventional runs a muck at Shrewsday Manor. Salut! And to you and Elvira! Hudson, you think I should soften and allow the dog a bit of Barbara Cartland? Now your talk’n. A little pink from time to time even does an old dog as I some good. Could Al possibly lift Phil by the shoulders and swing him to and fro? Is Kit Kat now scratching the big post in the sky? What’s Macaulay reading this week? Please tell him that I am Chekhov fan, but possibly he is, too. I haven’t checked his reading list, lately, Lame. Must bring him along to the National to watch The Cherry Orchard. Yes, Kit Kat has chosen a nice comfy soft spot in the sky and is glaring, outraged, down at our deeds day to day. Mac’s literary aspirations are higher than mine . . . I’ve never cozied up to Tolstoy, not even the Peace part. I tried Dostoyevsky over Christmas. There was so much back story I almost pulled my hair out. I decided life is too short to spend with Russian writers. Perhaps your dog could fill give me a synopsis? PS. I enjoyed the trip to Casterbridge. I like it when you take us on small outings. Pack a bit of wine and cheese for us next time. Will do, Barb. I love that – “so much back story I almost pulled my hair out.” You have summed up the reason many of us shirk those huge Russian tomes. I yield to Mac’s superior intellect. I never even considered tackling Tolstoy. Kit Kat was lucky in that moment; my nephew once opted to swing my cat Genghis by his tail. Genghis was … less than pleased. As was I.
Yerk! He found out the empirical way whether there was enough room to swing a cat! I am cooking up something Al as I write, Debra. He still comes up with the stories but I don’t get him to myself as much. He remains a master of the one-liner. Enjoyed this the first round, even more so the second, especially knowing the many more exploits of Big Al. Hurrah, hurrah! Snow at last. I have had a migraine and am late answering you, Penny. Hope you and the deer are still in a winter wonderland out there. How could anyone not love Big Al? Including old Kit Kat. You are right, Andra. How could I doubt it? Good point. Mac might have given up early on … disappointed he didn’t see the canine side of that story. I must say I held my breath wondering whether the cat was going to hiss or bite or claw to get out of being swung around like that. Amazing! Existentialist dog ? Poor fellow. Do they have dog shrinks ? He’ll need one.